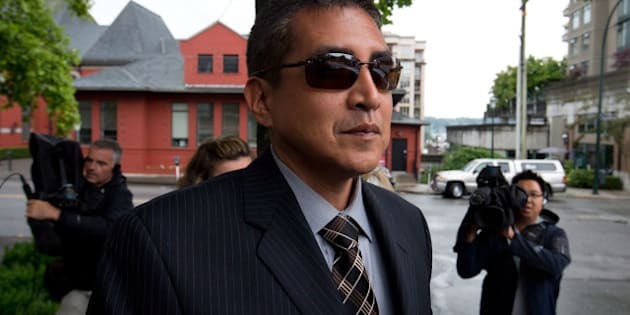 VANCOUVER - A former RCMP officer's perjury trial heard allegations Thursday that the four Mounties involved in Robert Dziekanski's death gathered for a private meeting in the weeks before testifying at a public inquiry. But a defence lawyer immediately attempted to cast doubt on the Crown's star witness — whose former spouse is related to one of the officers — suggesting the passage of time has caused her to mix up key dates and events. Former corporal Benjamin (Monty) Robinson is one of four officers who confronted Dziekanski the night the Polish immigrant was stunned with a Taser and died at Vancouver's airport in October 2007. Robinson, 44, who has since left the force, is accused of lying at a public inquiry looking into Dziekanski's death. The Crown's theory is that the officers colluded before speaking to homicide investigators immediately following Dziekanski's death and then again before the inquiry, fabricating a story to justify their actions. Janice Norgard, who once lived with a cousin of Const. Bill Bentley, testified that Bentley, Robinson and the two other officers involved in the case met at her home in late January or early February of 2009. The Crown alleges the officers held the meeting to prepare their testimony. Bentley was the first officer to testify, appearing at the inquiry on Feb. 25 of that year. Norgard said she was in the process of separating from Bentley's cousin, Brian Dietrich, who by then wasn't living at their house in Richmond, south of Vancouver, full time. She testified Dietrich told her Bentley and the other officers needed to use her kitchen for a meeting. Within a day or two, the officers arrived and Bentley introduced her to Robinson, Const. Kwesi Millington and Const. Gerry Rundel, she said. Norgard said she went upstairs to work, returning only once during the meeting to get some coffee. She saw the officers alone, without Dietrich, though she did not hear what they were talking about, she said. Norgard said she didn't think of the meeting again until last summer, after reading a news report that Bentley had been acquitted of perjury. Bentley was the first of the four officers to stand trial. "One of the things that was mentioned was he had been acquitted because the judge felt there was no evidence of the officers ever meeting, so I realized that I had evidence they had met and that I needed to come forward," said Norgard. Defence lawyer David Crossin suggested Norgard's timeline was incorrect. While Norgard insisted she and Dietrich were no longer living together by the time the meeting happened, Crossin showed the court affidavits from Norgard and Dietrich' separation proceedings, in which she said Dietrich didn't move out until March or April. Crossin suggested the meeting actually occurred in May of that year, as much as two months after Robinson, who was the final officer to appear at the inquiry, had wrapped up his testimony. "That is incorrect," replied Norgard. Bentley and Millington had both moved to Ontario by then. Flight records indicate Bentley flew to Vancouver for the inquiry on Feb. 15, while Millington arrived on Feb. 18. Prosecutors haven't said when they believe the officers colluded before speaking with homicide investigators shortly after Dziekanski's death. The Crown's theory is that the officers' initial statements and notes contain similar errors when compared with an amateur video that captured Dziekanski's death. The Crown argues the only way to explain those similar errors is that the officers must have colluded. Robinson has pleaded not guilty. His trial is expected to resume next week. Const. Gerry Rundel was also set to stand trial this fall, but the case was delayed at the request of the Crown and isn't expected to be heard until the new year. The Crown is appealing Bentley's acquittal. The appeal is also scheduled for the new year.